Valentine's Day: Drawn From The Heart, Your Most Memorable Valentine's Day Cards No snark or anti-commercialism rantings here, just a dose of simple sweetness. 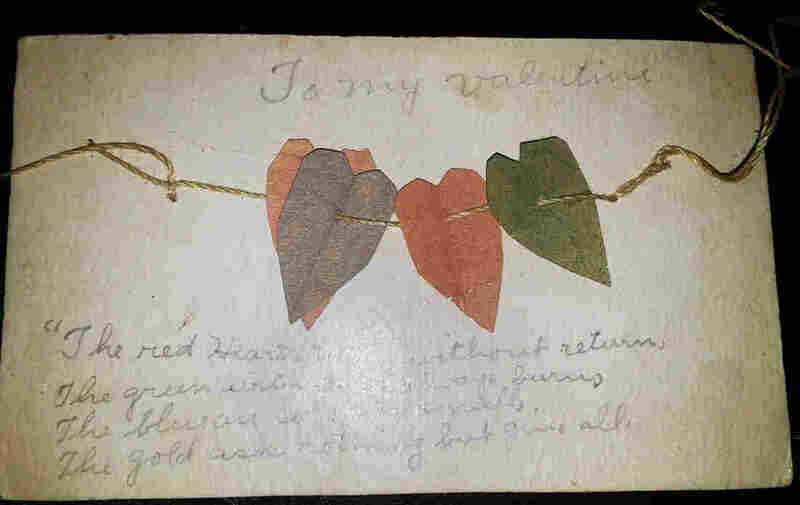 Readers share stories and photos — and an NPR artist re-creates a couple of valentines that live on only in memories. No snark or anti-commercialism rantings here, just a dose of simple sweetness. We asked readers to share their most memorable Valentine's Day cards; here are a few of our favorites, edited for length and clarity. 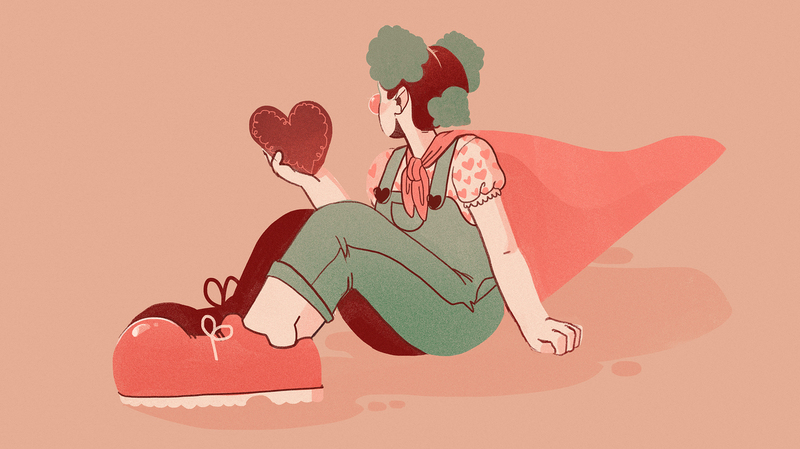 And we asked NPR illustrator Chelsea Beck to re-create two valentines that live on only in their recipients' memories. Renae Quinn, Rancho Cucamonga, Calif.
My favorite valentine ever was from my late husband on the Valentine's Day before we married. 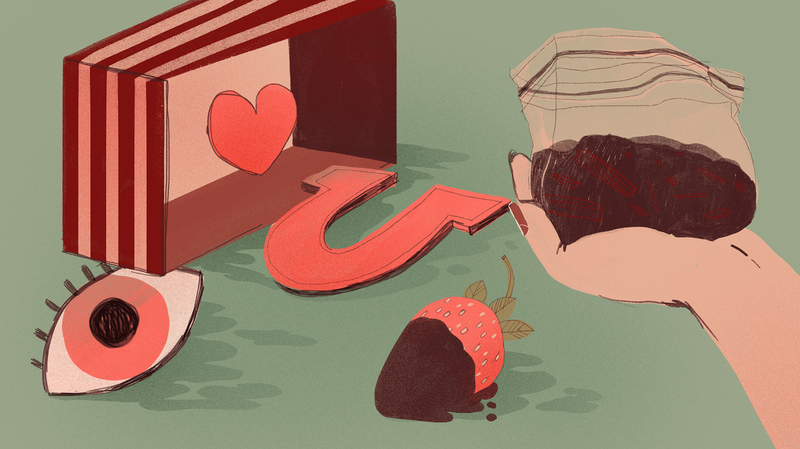 He gave me a box and lined up in the box were a drawing of an eye, a paper heart on a spring that popped up when I opened the box, a pink foam letter U, a chocolate-covered strawberry, and a baggie full of dirt from the garden in front of our apartment. I was mystified. I mean I got the "I love you so very" part clearly enough, but the dirt? I said, "You love me so very dirty?" I didn't care for that! He kept saying, "No, think about it." But all I could come up with was, "I love you so very dirt." He finally told me, "MULCH! It's mulch!" So it said, "I love you so very much." Duh. It's still my favorite ever. My grandmother saved everything! This is actually a good thing for me. She had an amazing, adventurous life, but I never got the opportunity to really get to know her "in person" because she lived far away from us (she lived in metro-D.C., we were in Georgia). Our visits with her were few, and she passed away when I was 6. So the only way I have been really able to know about her is through all of the interesting things she saved. One day, as I was looking through a box of her old report cards from grade school, I found this handmade Valentine she had saved. It was given to her by a friend named "Edith." It's on an old piece of cardstock, written in pencil, so it is very faded. It isn't dated, but it was with other items dated as early as 1910. She would have been 12 years old at that time. The gold ask nothing but gives all." The hearts are obviously hand-cut and threaded on a piece of string. Since there is not a gold paper heart, we believe there was a charm that was on the card, perhaps a gold heart-shaped button. Whatever the gold heart was, whoever Edith was, this Valentine has been kept safe for a century or more — a sign of enduring friendship, a friendship my grandmother obviously felt was as valuable as gold. As much as I adore my husband of almost 20 years, my all-time favorite valentine is not from him. I am an elementary reading specialist. I spend my days working with kids who need extra instruction in the areas of reading, writing and spelling. Last year, one of my students gave me a handmade valentine. His mom tells me that he thought of and completed the whole thing himself from start to finish, and was so proud of himself when it was done. hey mrs. ambrogie (sic), ya know that unit that we were working on that had the magic E that makes everything better? 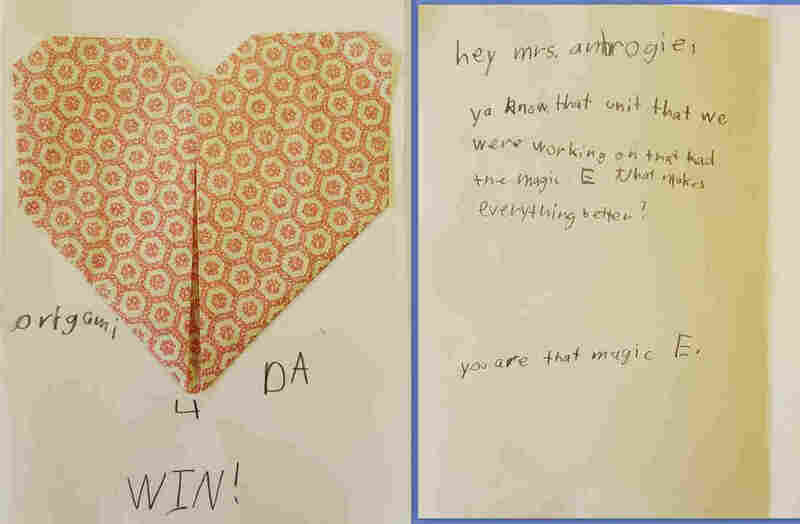 you are that magic E.
THIS is why teachers do what we do. Three years ago, when my son was 7, he made a collection of small valentines that he distributed throughout our house. Each valentine was unique, and each involved a heart shape. One was a simple red heart taped to the inside of a spoon. I found it while I was making my morning coffee and, of course, it brightened my day. Another was a pink bunny, who was especially cute because he was lopsided. Yet another was a series of yellow hearts arranged like petals of a sunflower. It was carefully taped to appear as if it were growing out from under my desk. I was impressed by his creativity, but more so by the fact that he woke up early to hide each valentine for my husband and me to discover as we went through our day. He didn't simply give us one valentine, he gave us a day full of discovering valentines. I was teaching second-graders how to speak English. I was teaching them similes to describe things. "You are as quiet as a mouse," "You are tall as the ceiling," etc. When Valentine's Day came, wild and crazy J.R. gave me a heart cut out of plain white paper. On the heart, he wrote: "You are as beautiful as Wonder Woman. You are as fun as clowns. You are as smart as God. Love JR."
I kept that valentine on my fridge until the sun bleached it out completely, some 14 years later. Thereafter, my sweet husband would remind me at bedtime that I was as beautiful as Wonder Woman. As fun as clowns. As smart as God. Just in case I forgot. For our first Valentine's Day, the love of my life wanted to give me a dozen roses. 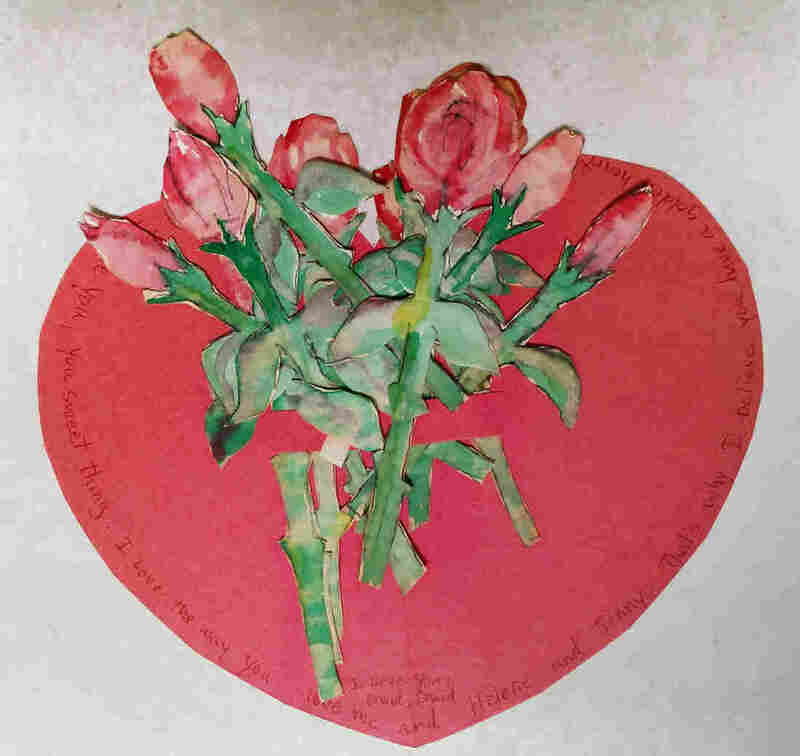 We had little money, so he did what he does best by making me a red heart with 12 water-colored blooms. It says: "I Love you sweet thing. I Love the way you love me and Helene and Jenny. That's why I believe you have a golden heart. I love you. David, David"
We've been married for 35 years, 36 in March. Taking this valentine out to share with you has been a sweet trip back in time.